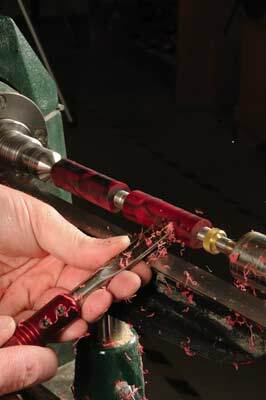 I used the barrel trimmer and mandrel in my workshop for a week instead of my usual equipment wherever possible, so they got a thorough workout. The barrel trimmer is smaller than the one I normally use, and is only suitable for kits that are based upon a 7mm (9/32in) tube. It is aimed at the beginner and is well suited to its purpose. It is robust and worked equally well in a hand-held chuck, or in a chuck on the lathe at slow speed. The cutting edges were not keen enough for my liking but a few strokes with a diamond hone and they were doing a fine job. If you only intend to make 7mm kits, this tool is all you will ever need. It is a great starter tool, and if you get the bug for pen making, you can upgrade to a more expensive tool later. The mandrel, whilst also aimed at the beginners' market, is by no means a beginner's tool. There was no occasion during the time I used it that I felt the need to revert to my own equipment. The first requirement of any mandrel is that it runs true and without vibration or flex. This tool ran true and every pen I produced with it turned out perfectly concentric - not always the case with some mandrels I have used. One of the key features of this mandrel is the adjustable shaft length, which enables the turning of many different kits, most of which use bushings with the standard 6.3mm bore. 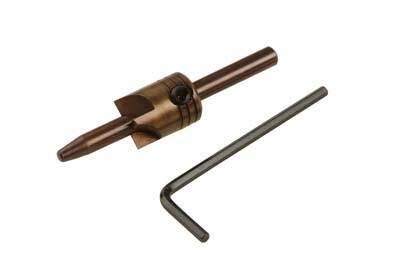 The mandrel comes supplied with standard bushings for 7mm pens and a set of cones for use with non-standard sizes. 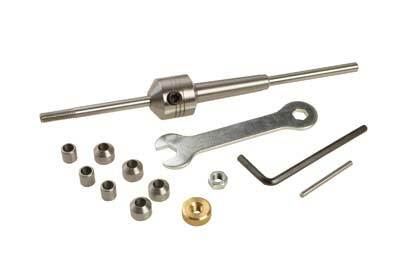 The bushings are tightened onto the shaft with a knurled nut, which can also be locked in place with a 6mm (1/4in) nut. The knurled nut is drilled to accept a small tommy bar for tightening and a simple pressed steel spanner is supplied for the nut. All in all, these tools are excellent value for money for the beginner to pen turning and the mandrel may be the only one you will ever need to buy.